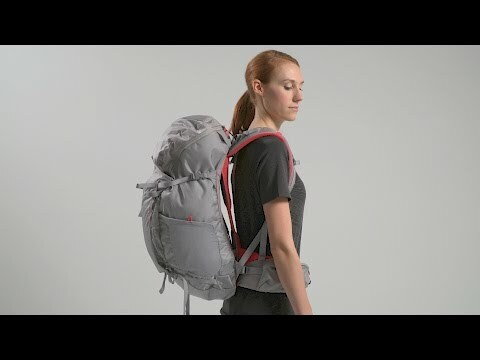 On give ‘er day hikes and light overnight trips, this pack wins. Sized for women, it's water-resistant, has reinforced webbing to protect your back, padded stabilizer fins and straps, attachment points for your stuff and hydration-ready sleeves and pockets. The pack uses MEC's Cross Wind back system: a 4mm steel wire to create a trampoline panel against your back. Lined with airmesh, it channels air into a space between the pack and your back to keep you cool as you ascend steep sections. Made of 210-denier nylon with a 1500mm water-resistant PU coating. Lined with 210-denier nylon oxford lining with a water-resistant coating. Women's version has a shorter back length, sculpted shoulder straps and flared hip pads. Bottom panel at back is reinforced with webbing to protect from rubbing your back. MEC Cross Wind trampoline style backpanel uses tension to create space between the pack and your back for serious ventilation. Backpanel is lined with airmesh. Padded, contoured shoulder straps with height adjustable sternum strap with integrated whistle. Strap keepers to prevent dangling. Load lifter straps on shoulder straps. Colour contrast bartacks and YKK zippers. Front stuff-it pocket with internal zippered pocket. Dual side mesh pockets for water bottles, bars or gear. Top zippered pocket with internal key clip. Compression straps on each side. Removable dual ice axe upper hook and loop straps attached to daisy chain. Hydration compatible with internal hydration sleeve, hanger hook elastic tube routing straps on right shoulder strap. Rain cover made of 75-denier polyester with a TPU water-resistant coating.